I'm quite annoyed with life at the moment as most things seem to be going wrong. At least I'm not stressed about work this week as I took the week off to sort my room and transfer everything to my new house. However, the electrician is now not coming until after Christmas to fix what he needs to fix. The roof leaks (see picture) which we are getting sorted next week. The kranky carpet man decided that he didn't want to put hard wood floor down in the kitchen so we did that ourselves (I have a picture of that too but a picture of a floor isn't very exciting). 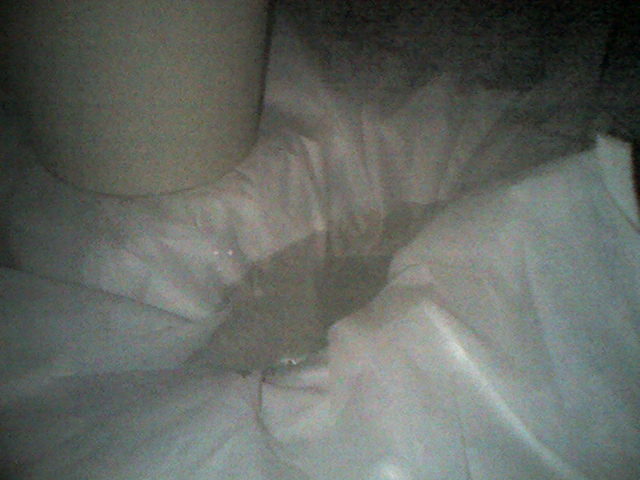 The water tank had a leak which has now been fixed. We aren't really very organised re transporting furniture and that needs putting in before the beds which would have been delivered yesterday but have now been postponed by three weeks which means we can't move in for another three weeks and my room is still a mess. I've also scratched my car on the wall at home after twice clipping it this week going into the space i've been going onto for four years. Cricket went bad on the last day of the 2nd Test as we were crap. Town are crap. We lost the quiz for the 4th week running on Monday even with Kate's mum's help. We got 80 out of 138 but there was one team who left after round one due to their poor performance. It's rained everyday since we noticed the leak in the roof. Why can't it ust be fine like the rest of the year? Good things that I haven't mentioned are Sky HD is great however it was the idiot who fitted who broke part (four things wrong with it) of the roof so that didn't go perfect either. Other than that i'm all smiles and looking forward to the student society Christmas Social tonight.